Taekwondo is a Korean martial arts form that has been part of the Korean culture for centuries. "Tae" means foot; "Kwon" means hand; and "Do" means Art or the Way. The full translation is, "The way of the foot and hand." There is much more to Taekwondo than hands and feet, however. For example, many students nowadays use Taekwondo as a way to release stress, feel at peace with their inner self, and develop their body, mind, and spirit for ultimate success during their martial arts journey at World Champion Taekwondo Gresham. Physically, Taekwondo can bring great benefits to the human body. In its combination of mind, body, and spirit, it can hone the body to the highest degree. It is also a beautiful martial art to watch. At World Champion Taekwondo Gresham, your whole body will be tested physically, resulting in healthy fitness and supreme martial arts ability, as well as increasing your mental strength and teaching valuable life skills. There are always many things to be learned on the road to Taekwondo. Embarking on a quest in martial arts is one of the best ways to achieve a new level of physical ability, mental fortitude, and overall wellness. We are more then just the premiere Gresham school of martial arts. 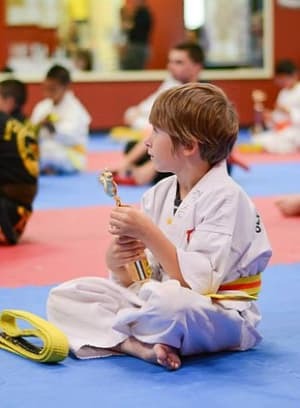 We provide a positive environment that helps each student reach their goals in Taekwondo without giving up, allowing them to achieve a sense of fulfillment and build confidence in themselves and their martial arts techniques. Parents will notice a difference in discipline, focus, and motivation in their child as we encourage our students to develop their better self through the practice of fitness and Taekwondo.